Holy wind! OMG the wind was literally blowing like 30 MPH. I was really not happy about it. I hate it when I fix my hair and walk outside into a tornado. It is a miracle that Matt got any good pictures. Most of them I looked really mad because I was. Haha. I hope you all have a great weekend. I am planning on relaxing as much as possible this weekend because I feel like I am coming down with a cold and I start my stimulation on Monday and I am so nervous about it. Thank you all so much for your continued support! It means so much to me that you all read and follow my blog! I truly appreciate all of you. Gorgeous look! Love that scarf and necklace paired together! So pretty! Thanks you too!! Thank you for always leaving such sweet comments! They mean so much! Perfect wedges and bag, you look fantastic! I had a giggle this morning.....I almost wore the same thing. However my white pants didn't come high enough and I can't show stomach skin at work. Love it with the white though! This is the perfect casual outfit. Thank you for always leaving such sweet comments! They mean so much to me! Super cute outfit! Love that scarf! 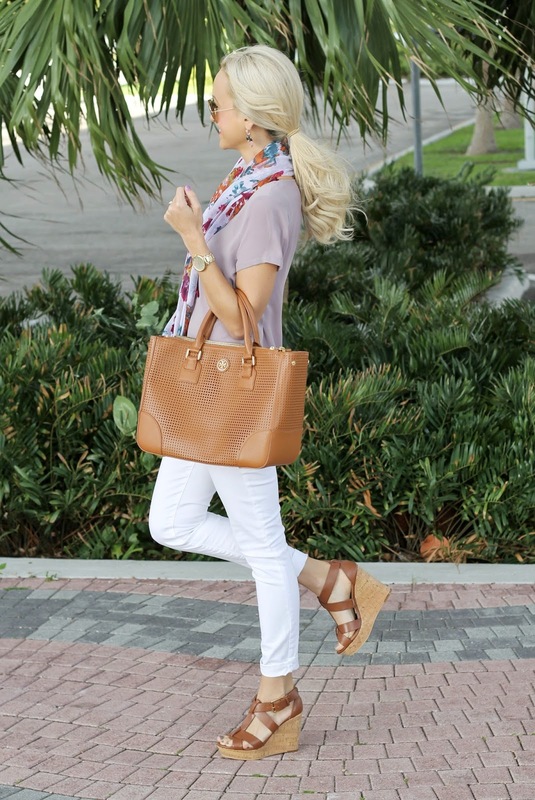 Great spring outfit...love the scarves you mix into your outfits! Your outfits always looks so put-together and perfect! I love it! Great spring outfit, the scarf is so lovely! And the colors, so gorgeous! Have a great weekend. so beautiful! so stylish spring look! Very chic and stylish outfit! So cute! Best to you Monday! Great look! Love your floral scarf! Good luck with everthing starting this week! You are such a strong and gorgeous inspiration! I came across this look on Pinterest, and it's the first I've ever recreated. Thanks for the inspiration! Isolation of liquid and also many types of the market and is the most insidious at all and the highest price of insulation (epoxy) and then comes after the isolation of gauze (Saiko Prove) (DJ 5) and (Epoxy transparent pool and a pool) شركة جلي رخام بالدمام The main insulation requirements used by a water insulation company in Riyadh: شركة عزل خزانات بالدمام is keen to use the best membranes and materials optimization to ensure the best service and high quality to its customers and therefore uses membranes with special requirements, including: Resistant water leaks with high efficiency. The membranes used are highly resilient. These membranes correspond to general working conditions, requirements and climate variability. Membranes are long-lasting and have high adhesion strength in all conditions.